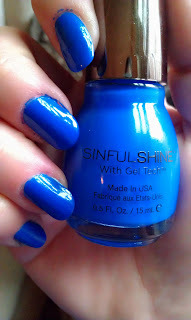 I'm Not Skinny: SinfulSHINE Swatches. I managed to get my hands on the SINFULSHINE Gel Tech colors from Walgreens. They were slowly rolling them out and I was so excited about the vibrant colors (and the price coming in at only $2.99 each). I found it tough to select which colors I really wanted...but I'm happy with the three I picked up and no doubt will be getting more of them! Check out all of the colors here. The images above are without any top coat. They really do SHINE. It's the coating that I'm not 100% happy with. I have very white nail tips, so when I paint my nails, I'm always looking to cover that tip color and maybe that's unique to me, but that is what I like. I'll start from left to right. BANANAPPEAL - This yellow is gorgeous. In the image you see it's 3 coats of the color. Clearly when a polish promises to last, I don't want to have to resort to a white base coat because then I'm loosing the benefit of the Gel tech. Small notch off of that one for me, but I'd still recommend it. SAILOR'S DELIGHT - BEAUTIFUL, that's all I think of when I see this pink. It's a dusty light pink with a delicate but bright pigment. You're looking at 3 coats here as well, because the color coverage isn't quite what I personally like. MOST SINFUL - My new favorite color. It's a bright powerful cobalt blue that really grabs attention. As I was swatching a friend noticed the color and jumped right on it, she painted her nails with it and got compliments for days. It's the perfect shade for summer, great for toes, great for fingers...it's perfect. I only needed two coats for the coverage I like and that's what pictured here. Now to talk about the overall shine, I found that it's true they do shine like a top coat and it's a beautiful shine. 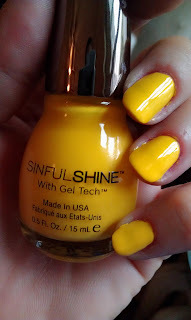 I am planning to play around with how they last, but for now SinfunSHINE has my seal of approval. That was a nice nail polish because then you don't need to buy a top coat! Smart idea! Cobalt blue is my favorite color, I am not able to paint my nails. They look like a toddler did it when I try. Nice colors. I may have to check them out. I would love to have the blue and yellow colors. My Mom has been raving about that gel nail polish--she has it done at a salon and where she used to have to go every week--now it lasts 3 weeks. I would probably go with a red color--still can't convince myself to have blue nails!! I love the blue polish! I don't like having to apply 3 coats of polish though. That takes me forever to do my nails when I have to put so many coats on. I definitely want that blue! I used to have a color close to that and I'm out now. Very pretty choices... i like the yellow one. The yellow and cobalt blue are gorgeous!